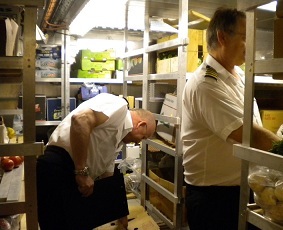 Easter Sunday and the Captain, together with the purser, go about their weekly check for safety and cleanliness, taking in every corner of the ship (and finding some chocolate eggs in the dining room, much to everyone's delight - thank you, Kate!). A busy morning: the CTD was recovered in the early hours, and all the equipment sent down on it for testing was unscathed. After the CTD, we moved the ship and deployed a mooring that will stay on the seafloor for two weeks. 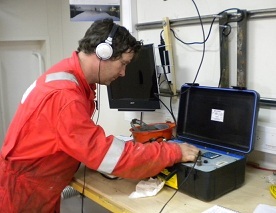 The mooring was put together by Dan, consisting of 300 m of line with a series of instruments attached to it. These included a series of mini-CTDs, and a titanium tube containing glass plates for one of Alex's microbial colonisation experiments. 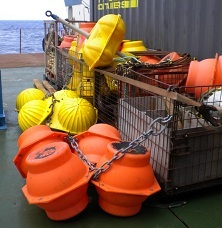 The mooring also carries orange floats so that it stretches out above the seafloor, and a weight that acts as an anchor. Just above the anchor are the acoustic releases tested on yesterday's CTD. When the time comes to recover the mooring, Dan will send down a sound signal to trigger these releases, detaching the mooring from its anchor weight so it can float back up to the surface. Later in our expedition we will be deploying 1000-metre moorings carrying, among other things, whale bones. These particular bones, which are stored in a freezer, come from a dead whale that washed up in Cardiff Bay in October 2009, collected by marine biologist Adrian Glover at the National History Museum in London. Whale skeletons support colonies of marine life related to those at deep-sea vents. Leaving bones down on our moorings for at least a year will show us what colonises them in extreme depths of the Cayman Trough.